Long before Ronald Reagan became the 40th President of the United States, he was a popular actor appearing alongside Errol Flynn in Desperate Journey and co-starring with a chimpanzee in Bedtime for Bonzo. Reagan’s first film, Love Is On the Air, was released in 1937, and by 1941, a poll of movie theater owners ranked him fifth among up-and-coming movie stars. And what’s a celebrity to do but give celebrity endorsements? Enjoy these 14 vintage advertisements featuring a pre-politics Ronald Reagan. Reagan and his first wife, actress Jane Wyman appeared in a few ads together, such as a 1941 Chesterfield cigarettes ad and the above Royal Crown Cola ad in 1947. The two met on the set of the film Brother Rat in 1938 and kindled a romance during a nine-week "Stars of Tomorrow" performance tour the next year. They married in January 1940 and starred in four movies together that year, becoming fixtures in the gossip pages of movie magazines like Modern Screen and Photoplay. Reagan and Wyman separated in 1948, divorcing in 1949, and Reagan married Nancy Davis, the future First Lady, in 1952. "'Pipe this!' cries Ronald." Apparently, Marlboro shirts feature "Soft-as-smoke fabric," but don’t get confused: the Marlboro Shirt Company was unrelated to the Marlboro cigarette brand, which has been produced by Philip Morris since 1924. Founded in Baltimore in 1907, the clothing company still exists and now goes by the name Marlboro Originals. The above holiday ad appeared in the December 13, 1947 issue of the Saturday Evening Post and in the January 1948 issue of Esquire. Despite appearing in multiple Chesterfield advertisements—like this one from 1948—Reagan did not smoke cigarettes. He did smoke a pipe, writing in his autobiography, An American Life, that he took up the habit in college because he thought it looked cool: "I'd never liked cigarettes, but I was impressed by a flurry of ads in those days in which women said, 'I like a man who smokes a pipe.' I’d always liked the look of someone smoking a pipe, so I saved up and bought one. But I never inhaled. I just sucked in the smoke, tasted it, and blew it out—and I only did that during the offseason, when I wasn’t playing football." After his brother, Neil, a two- or three-packs-a-day cigarette smoker, developed laryngeal cancer in the 1960s, Reagan quit smoking his pipe and picked up a Jelly Belly habit instead. Reagan appeared in another advertisement for Marlboro Shirt Company in Life magazine, showing off a couple of collar styles just before Easter, 1949. This ad was featured in the December 3, 1951 issue of Life magazine. In 1947, Chesterfield had changed their marketing strategy to heavily emphasize celebrity endorsements, and by this time, famous spokespeople for the brand had included Lucille Ball, Joan Crawford, Betty Grable, Rita Hayworth, Barbara Stanwyck, Gary Cooper, Bing Crosby, Kirk Douglas, Bob Hope, Gregory Peck, Frank Sinatra, and Jimmy Stewart. Campbell Soup Co. purchased V8 (then styled as V-8) in 1948 and began running a series of print advertisements for the vegetable-blend juice featuring celebrities, including both Reagan and Shirley Temple. This advertisement appeared in the February 5, 1951 issue of Life magazine, among other places. Hair tonics—lightweight, alcohol-based hair products—were popular in the '50s and still show up in barbershops today. Men used tonics to get a crisp part and to add shine to the hair without making it greasy. And Reagan wasn’t the only celebrity singing Jeris’s praises—Kirk Douglas also endorsed the brand. This February 1951 ad for the Cigar Institute of America suggests that Reagan's approach to cigars was the same as his approach to pipes: smoke, just don't inhale. Dating to sometime during the 1950s, this advertisement for Wildroot Cream Oil is equipped with a cardboard easel and seems to have been designed to sit in the window of a barbershop, using Reagan’s glossy hair and confident grin to draw in customers. Infused with lanolin, Wildroot is an oil-based grooming product meant to serve the same purpose as a hair tonic, with added moisturizing properties. Reagan would become a famous General Electric spokesman, but before taking on that role, he endorsed Westinghouse appliances in this April 1953 advertisement. According to the ad (he's third from the left along the front row), his favorite Westinghouse feature was "the Laundromat's Weigh-to-Save Door and Water Saver." Reagan would begin working with GE the next year. Reagan appeared in this Van Heusen campaign in 1953, and in January 1981, the company re-ran the ad with a celebratory message in Time, Newsweek, and People magazines to congratulate Reagan on the eve of his first inauguration. 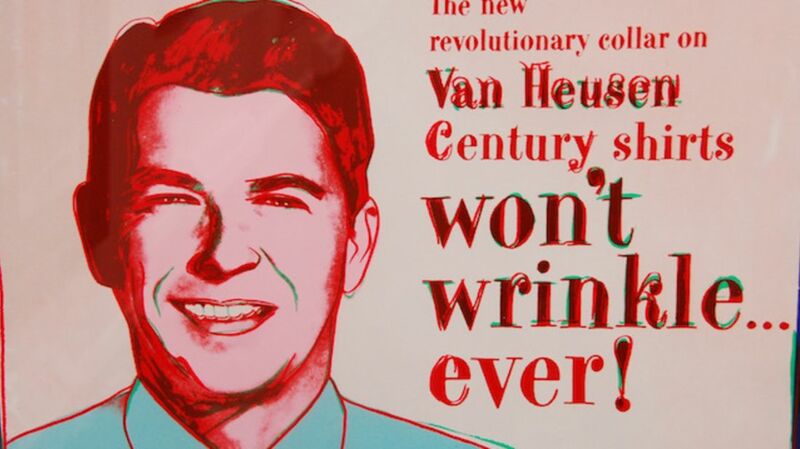 Then, in 1985, Andy Warhol used this same ad as a basis for his screenprint "Van Heusen (Ronald Reagan)" in his "Ads" series. In 1954, Reagan was hired by General Electric to host General Electric Theater, a popular CBS anthology TV show that mixed dramatic stories with advertising for GE products and the modern "electric home" more generally. It ran for two seasons without a host, then introduced Reagan in the third season to give the show a more consistent voice. At a low point in his acting career, Reagan was enticed by the offer of steady work—and a starting paycheck of $125,000. Along with his salary, GE also turned the Reagan family’s home in the Pacific Palisades into "the most electric home in the country." In a recurring segment, the show would "check in" with the Reagans, exploring their house as the family demonstrated and praised their "electric servants," as they called their GE appliances. The tagline for these segments was "Live Better Electrically," the name of a multi-million dollar campaign co-sponsored by GE and Westinghouse that aimed to sell not just specific products but the idea of a home populated with appliances and reliant on electricity. Launched in 1956, the "Live Better Electrically" campaign marketed a vision of the modern American home as an "all-electric" home—catchy jingle and all. In this advertisement in National Geographic from 1959, Reagan touts the luxury of train travel in a Union Pacific Domeliner, a special passenger car topped with a glass dome that offered panoramic views. The Domeliner had snagged another A-list endorsement a couple of years earlier—it got the full-episode treatment on I Love Lucy when Lucy, Desi, and company took a long trip on the luxury liner (which Lucy ruined when she kept pulling the emergency brake). This advertisement appeared in 1961 when Reagan was still presenting General Electric Theater, which he hosted the show until the following year. With Reagan at the helm, GE Theater had become a top-10 show in the Nielsen ratings between 1956-'58, and celebrities like Fred Astaire, Bette Davis, Judy Garland, and the Marx Brothers all made guest-star appearances.